With Easter just around the corner, my thoughts are turning towards the traditional Easter lunch, and what my family and I are going to eat after the one time of the year when we legitimately get to eat chocolate at breakfast time! A simple but flavourful soup that can be ready in minutes! Perfect for a light starter. 1. Heat the olive oil in a medium saucepan and saute the onions and garlic, until softened. Add the chopped leek and celery and cook for a further couple of minutes. 2. Stir in the peas and cashews, then add the stock and balsamic vinegar. Season with salt and pepper and simmer for 5 minutes. 3. Transfer to a blender and mix until smooth. 4. 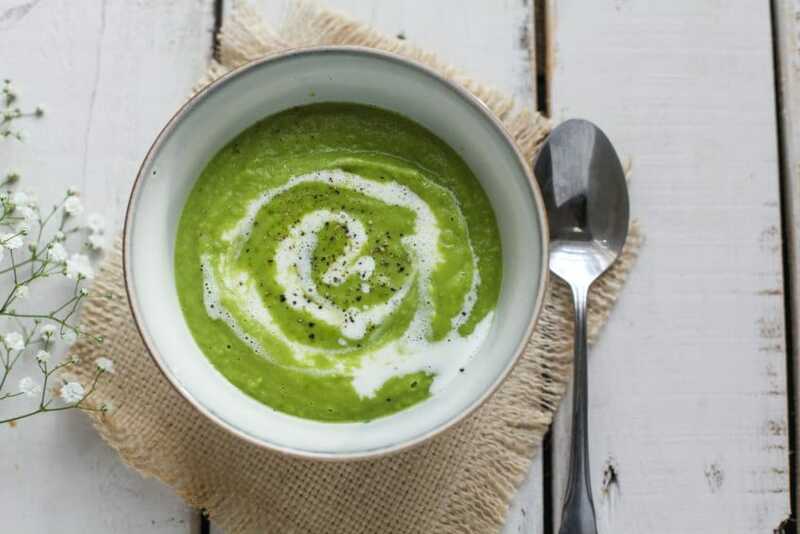 Ladle the soup into four serving bowls and top with a swirl of dairy-free cream or soy yoghurt. 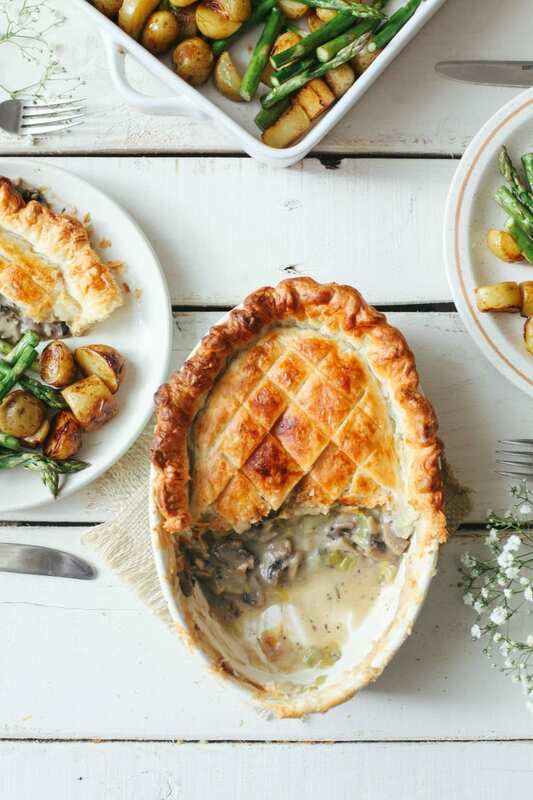 Creamy mushrooms and leeks encased in a crispy, golden pie crust. Delicious, filling and a great choice to serve to both vegans and meat-eaters! 1. Add the olive oil to a large saucepan on a medium heat. Fry the leeks and garlic for 2 minutes, to soften. 2. Add the mushrooms, herbs, salt and pepper and stir for a minute. Place the lid on top and cook for 8 minutes. 3. Meanwhile, in a small saucepan, melt the dairy-free butter on a medium heat. Add the flour and stir until combined. Slowly add in the milk, a tablespoon at a time and whisk, until you have a smooth thick mixture. Stir in the nutmeg and season with salt and pepper. 4. Combine the cooked leeks and mushrooms with the sauce and leave to cool completely. 5. Make sure your puff pastry is at room temperature (if using frozen, leave at room temperature overnight) and preheat the oven to 200C. 6. Add the leek and mushroom mixture to a pie dish and top with the puff pastry, cutting off any excess pastry around the edges. 7. Crimp the edges using a fork and score a criss-cross pattern on the top with a sharp knife. Finally, dip a pastry brush in a little dairy-free milk and brush the top of the pie to help it brown. 8. Cook for 25 minutes until golden brown. Serve straight away. 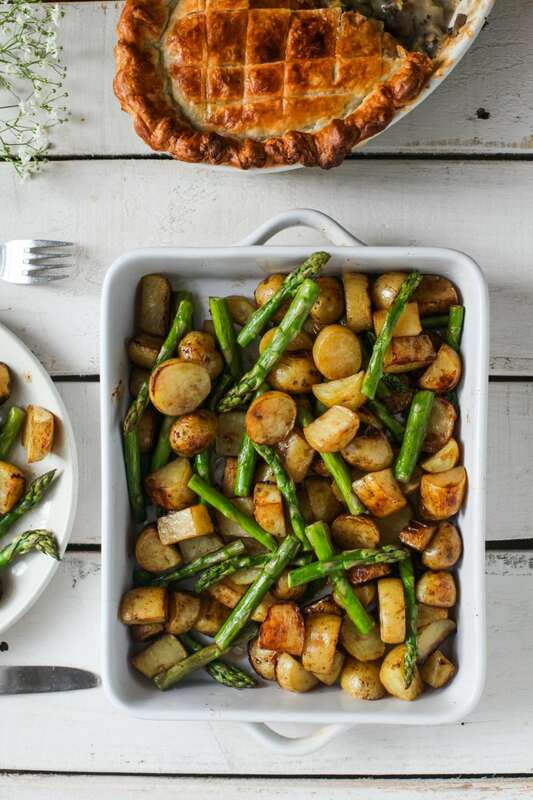 A flavourful side dish featuring seasonal asparagus and new potatoes. Salty potatoes paired with the subtle sweetness from the asparagus and balsamic vinegar make this utterly moreish! 2. In a large roasting tin, add the olive oil, balsamic vinegar and salt. Add the potatoes and toss to coat fully before roasting for 30 minutes. 3. After 30 minutes, add the asparagus with a little extra olive oil, if needed. Toss to coat and cook for a further 10 minutes. 4. Season with extra balsamic vinegar, salt and pepper. 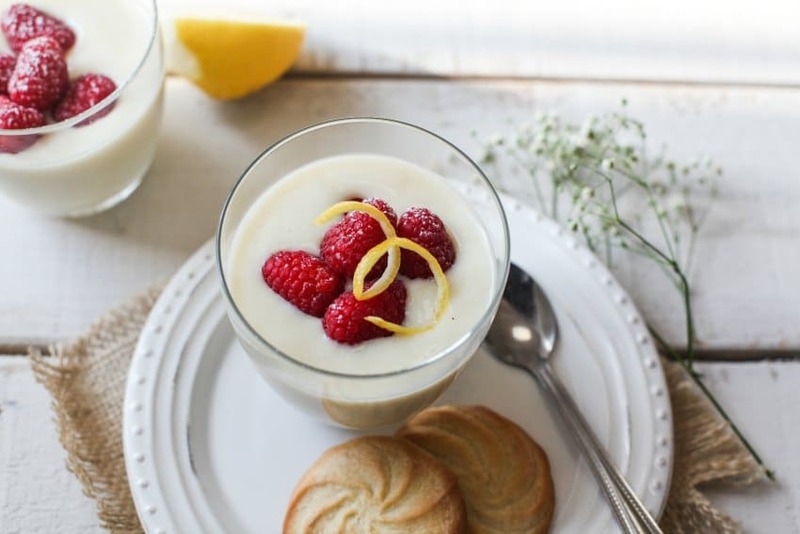 Ultra creamy lemon puddings with sweet, crumbly shortbread cookies – perfect for dipping! 1. Blend all the ingredients, except the raspberries and icing sugar, together in a food processor until smooth. 2. Divide the mixture equally between 4 glasses and chill for at least an hour or overnight. 3. To serve, top with fresh raspberries, a sprinkling of icing sugar and 2 shortbread biscuits (see recipe below). 1. Preheat the oven to 180C and line two baking trays with baking paper. 2. Mix the dairy-free butter and icing sugar together in a large bowl. Add the rest of the ingredients, except the dairy-free milk. 3. If the mixture is too stiff, add the dairy-free milk to help thin it out until you have a soft but firm mixture. 4. Transfer to a piping bag with a large star nozzle. Pipe the mixture into small circular spirals. Starting from the outside, working your way in. Try and keep them all the same size! 5. Bake for approx 12-15 minutes until lightly golden. Leave to cool completely. All recipes and images Aimee Ryan for Wallflower Kitchen Copyright: The Vegan Society, 2018. In terms of honey I prefer the Carpathians Raw Honey , the price reflects the quality of their service.